My trip to Rocklands is going amazing so far. I'm only half way through and already I've had the time of my life. This place is really incredible. There's as much rock as your eyes can see and most of it is excellent quality. All the lines are straight forward power problems. I've been living in a cottage in the Cederberg Mountains with 4 amazing people. We are all having the best time so far. Between the five of us we've been sending almost everything. I came here with only six problems in mind for sending. These are things that I've known to be some of the best hard lines in the Rocklands. I've already done two and have hit all the moves on the other four. There will be a lot of video uploaded after we all return to the states where internet communication is a bit more advanced. The lifestyle out here is to be dreamed of. Rustic, simple, cheap, great food, and all the climbing you could ever want. I am currently taking a prolonged rest to properly recover from the severe beating my body's been taking from constantly climbing on steep, powerful lines. I have about 6 weeks left here to complete my other projects. It seems like plenty of time but with all the rest days it doesn't equal too many climbing days. I'm not too worried though because I intend to come back to this place where these projects and many others will always be waiting. It appears the World Cup in South Africa has scared many others away. It is not very crowded this year at all. This trip it feels like we just about have the whole place to ourselves. The weather has been very good as well. We've had about 4 days of rain total in the last month. The temps couldn't be better. I'm excited to end my days of rest and get back to climbing again. At the same time, I'm really enjoying these rest days. It feels like I am really on vacation when I'm just waking up on a beautiful day with the intention of doing nothing in particular. I spend my rest days hacky sacking, chopping fire wood, reading, stretching and editing climbing footage. It is always fun to follow around the group to watch your friends get psyched to send there projects. 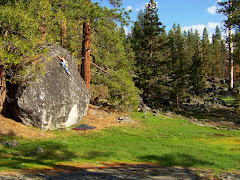 I'll give a more detailed update on the climbs I've been doing while here after I get back to the states. Tomorrow is a town day. We're going into Clanwilliam to use internet, eat lunch at Koffe Cafe, and going shopping at our favorite store, the Super Spar. It will no doubt be a productive rest day. In the meantime, everyone have fun in Tahoe and I'll be in touch as soon as I get back. Jesse, Dave here from Ottawa. We climbed a session together on Rorschach Test in Nov a few weeks before you got it. Either way man, hope you're having a good trip and I can't wait to see what footage you have. did anyone else notice the rainbow-splash of light across the organic pad in the picture of Shoshaloza? Great photo and very interesting coincidence! what are the 6 problems you mention?